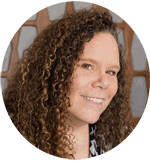 February 10, 2019 By This post may contain affiliate links. 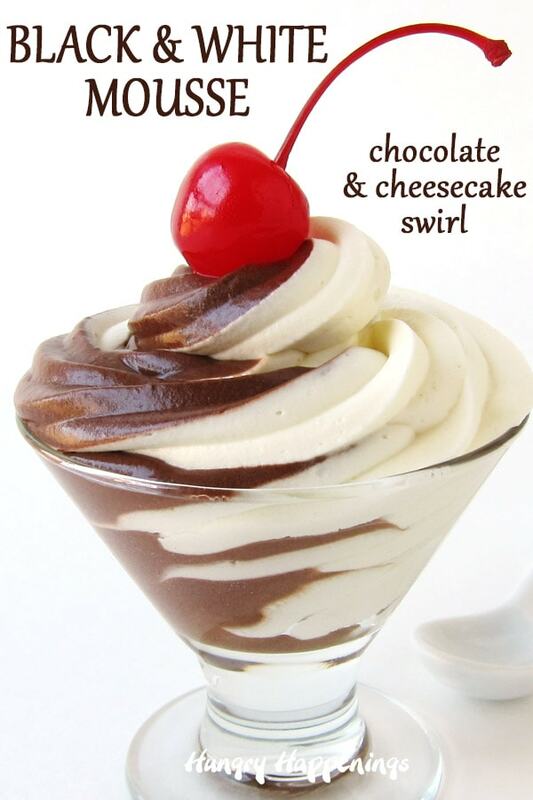 Can’t decide between chocolate mousse or cheesecake for dessert? 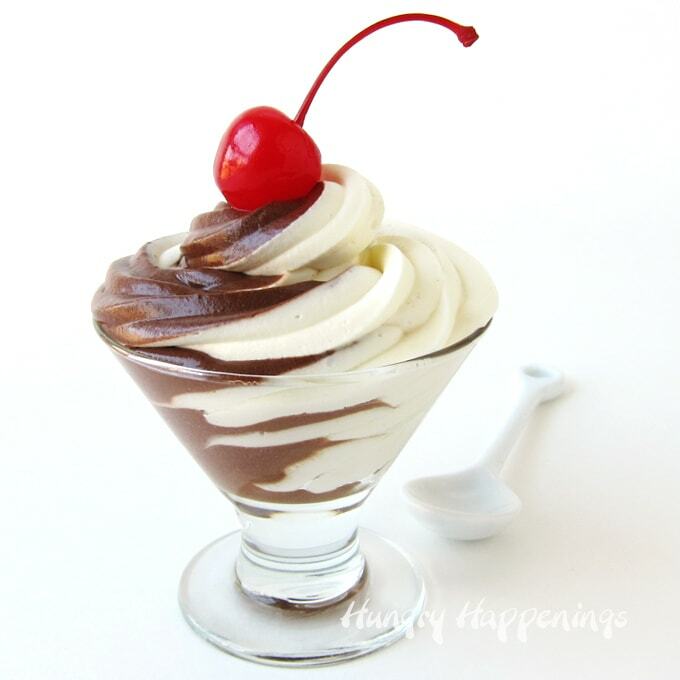 Why not combine the two into this decadent Black and White Mousse. This silky smooth chocolate and cheesecake swirl mousse makes a fabulous dessert for Valentine’s Day, New Year’s Eve or any dinner party. Is your mouth watering yet? It’s hard not to look at that picture and not want to take a spoonful of that black and white mousse. Isn’t it? I’ve combined two of my absolute favorite desserts together into one incredible dessert because sometimes I just can’t decide between chocolate mousse and cheesecake. So, why not have both? The tang from the cream cheese in the cheesecake mousse is such a nice contrast to the decadently rich dark chocolate mousse and I love it. I hope you do too. To make this dessert you’ll first need to make a batch of the BEST Chocolate Mousse. You can see my very detailed tutorial for making my favorite chocolate mousse here, but below are some helpful tips. To make the best chocolate mousse you need to start by using your absolute favorite chocolate. Use semi-sweet chocolate if you prefer a delicately sweet chocolate mousse dessert. Use bittersweet chocolate if you prefer a more robust and slightly bitter chocolate mousse. The higher the cocoa content the more robust the chocolate flavor will be in your mousse. 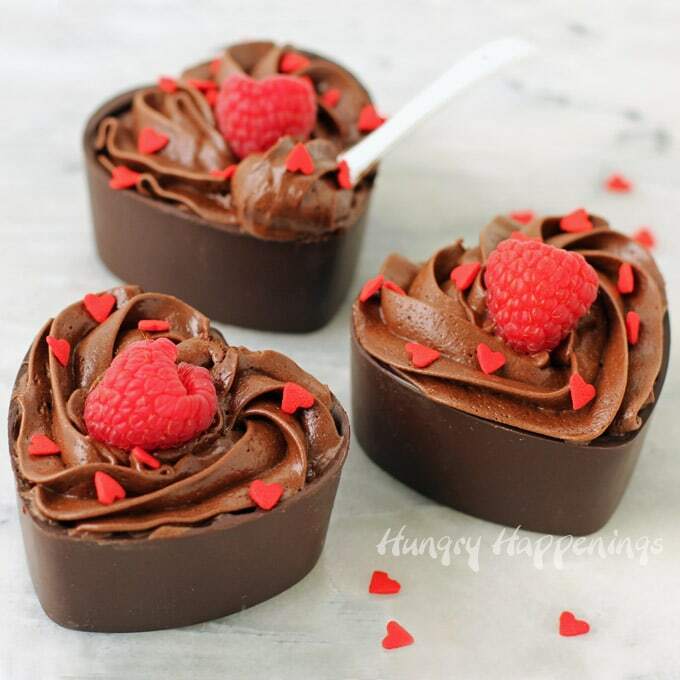 If you choose a chocolate that you love to eat, it will taste great in this mousse. Don’t use chocolate that simply tastes alright if you want a really superior tasting mousse in this recipe. What Brand of Chocolate do you suggest? I personally prefer the flavor of Peter’s Burgundy Semi-sweet Chocolate but it comes in large 10 pound bars usually in 50 pound cases. I would totally recommend getting a bar if you like to make a lot of chocolate desserts. It will keep for up to a year if stored at room temperature. Speaking of Trader Joes, they have some really great 1 pound chocolate bars that have really nice flavor and they are relatively inexpensive. There are so many other wonderful chocolates that are available in grocery stores too. Just choose any that you really like. I personally would not use the ever popular Nestle Chocolate Chips to make this mousse. They are fine in chocolate chip cookies but not so great in this mousse recipe. Can I use Candy Melts or Almond Bark? You can but I would not! I do not recommend using confectionery coating/Candy Melts (made with partially hydrogenated palm kernel oil) to make this mousse. The flavor will definitely not be as good as a chocolate mousse made using pure chocolate (made with cocoa butter). This recipe will create the most amazingly rich, silky smooth, chocolate mousse. It uses egg yolks and heavy whipping cream which add to the richness and creaminess. Simmer 3 tablespoons of water and 3 tablespoons of granulate sugar until the sugar dissolves. 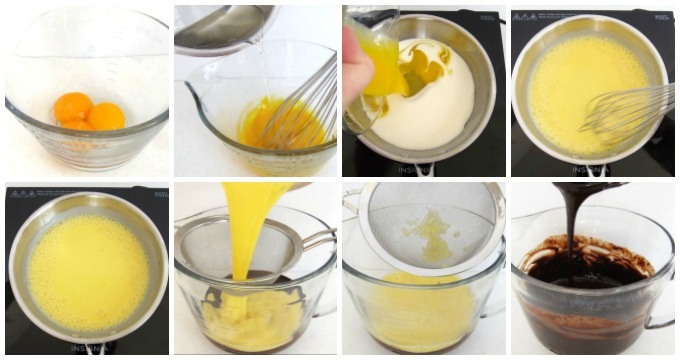 Whisk 3 egg yolks together. Continue whisking then slowly drizzle the hot sugar syrup into the egg yolks. Pour the egg mixture through a fine mesh sieve into a bowl filled with 12 ounces of melted chocolate and discard what remains in the sieve. Stir until blended and creamy. Fold in 2 cups of whipped cream. You want the egg yolk mixture to reach at least 140 degrees in order for them to be pasteurized and safe to eat. If you don’t have a thermometer you can cook the mixture until it thickens slightly into a custard. Stir this mixture constantly! Do not walk away or it can curdle. If you continue to heat the mixture to about 170 degrees F, the custard will thicken. When mixed with the chocolate and cream the mousse will set up more quickly and may not need refrigeration to firm up. It may be ready to pipe into bowls immediately. When you stir the egg yolk mixture into the melted chocolate the chocolate may be beautifully smooth but it also may seize up and create lumps. If it does get a bit lumpy, you can use a stick blender to blend it until smooth. OR if the chocolate feels too cool, then you can heat it in the microwave for 15 seconds on high power to melt the lumps. The mousse might be rather thin just after it’s made and will need to chill in the refrigerator for about and hour or two until it thickens up. The thickness of the prepared mousse will depend on how much you allowed the eggs/sugar syrup to thicken. No matter how thick the mousse is just after it’s prepared, it will thicken up nicely once refrigerated. Beat 8 ounces of cream cheese with 1/3 cup granulated sugar until light and fluffy. Add 1/2 cup marshmallow fluff and 1/2 teaspoon vanilla and beat until well combined. Then beat in 4 cups of frozen and thawed whipped topping (Cool Whip) or fold in 4 cups of homemade sweetened whipped cream. I like to use Cool Whip when making this easy cheesecake mousse because it saves me a few steps but homemade whipped cream works great too. Just be sure to fold in homemade whipped cream so you don’t deflate it too much. Blend together 2 cups of heavy whipping cream with 1/3 cup powdered sugar and 1 teaspoon vanilla. Beat on low speed for 15 seconds then increase the speed to high and beat just until stiff peaks form. 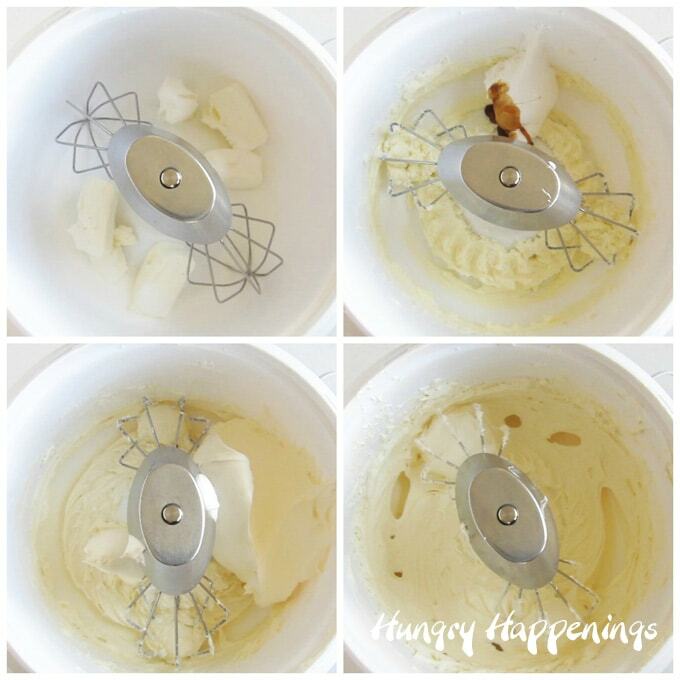 You want the whipped cream to hold it’s shape when the beaters are removed. Just don’t over beat the cream or it will separate. Fill one pastry bag with about 1 1/2 cups of chocolate mousse. Fill another pastry bag with about the same amount of white cheesecake mousse. Put a large star tip into a third pastry bag. Snip off the tips of the two filled bags and snuggle them up next to each other in the third bag. Squeeze the mousse out of the pastry bag until both colors of mousse appear. Pipe swirls of the mousse into small dessert cups. Top with a maraschino cherry, a small strawberry, or a few raspberries if you’d like a pop of color. This recipe will make approximately 5 cups of chocolate mousse and 5 cups of cheesecake mousse for a total of about 10 cups of black and white mousse. The number of servings will depend on the size cups you use. I got 14 servings of the black and white mousse each with approximately 3/4 cup of mousse. 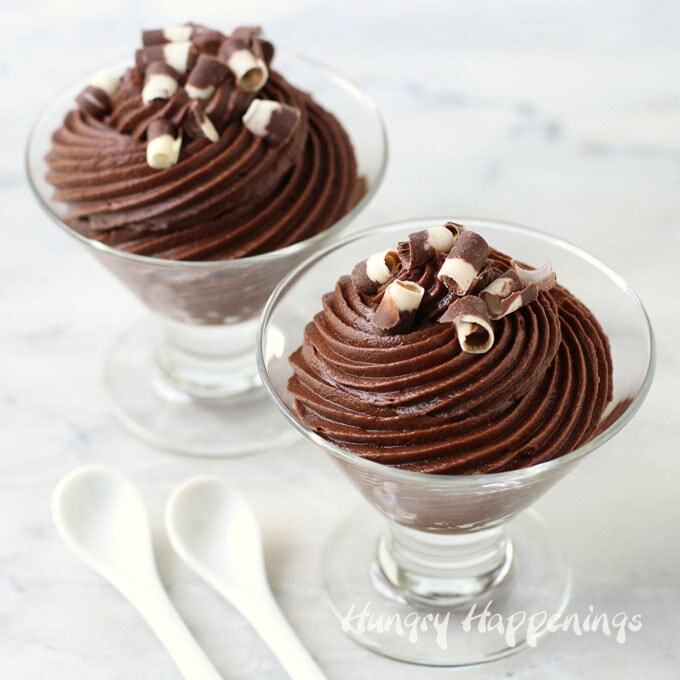 Watch the video to see how to make both the chocolate mousse and cheesecake mousse and how to swirl them together to create pretty black and white mousse cups. Decadently rich chocolate mousse is swirled with creamy cheesecake mousse to create this beautiful black and white mousse. Stir in the egg mixture and continue to stir for at least 3 minutes until heated through (and registers at least 140 degrees Fahrenheit). Combine cream cheese and sugar in a large mixing bowl. Using an electric mixer, beat on medium-high speed until light and fluffy. Add marshmallow fluff and vanilla bean paste or extract and beat until well combined. Pour in whipped topping and beat until creamy and smooth. 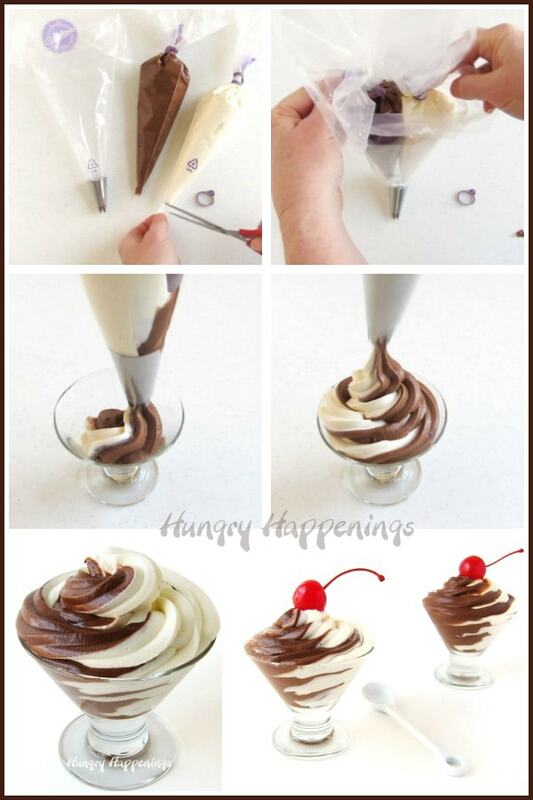 If using real whipped cream, gently fold it into the chocolate mixture. Fill one disposable pastry bag with about 1 1/2 cups of dark chocolate mousse and fill another back with about the same amount of the cheesecake mousse. Fit a large pastry bag with a large star pastry tip. Cut off the tips of the filled bags then snuggle them down into the third bag. Squeeze until the mousse comes of of the bag and you can see both colors of mousse. 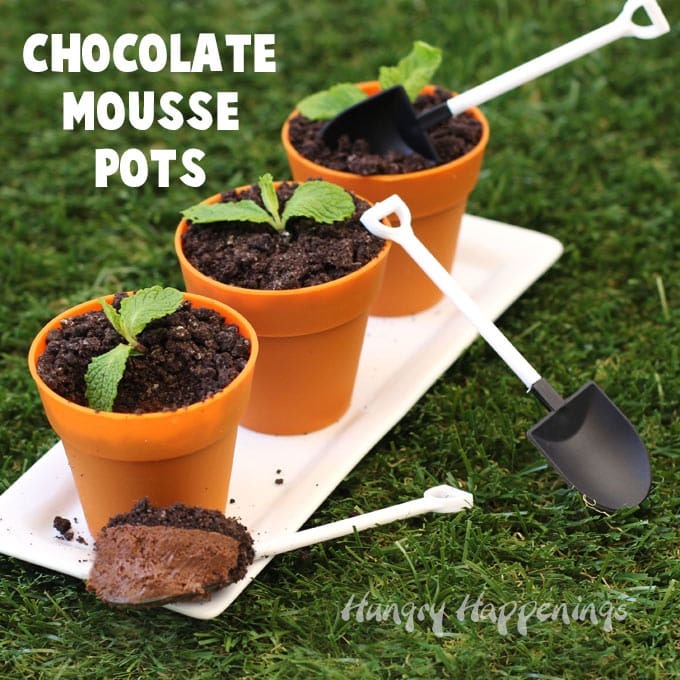 Pipe between 2/3 and 3/4 cup of the swirled chocolate cheesecake mousse into small dessert cups or bowls. See all my dessert recipes, here. Will you make this Black and White Mousse for Valentine’s Day, New Year’s Eve, or another occasion? Fun food for parties and special occasions. Cuz I love being in my kitchen making yummy chocolate or cheesecake desserts more than I like cleaning my dishes. Previous Post: « Make the Sweetest White Chocolate Strawberry Panda and Polar Bears for Valentine’s Day! Beautiful and yummy all at the same time!